Wow, can you believe this crazy weather we are having..?? Well, here anyway it is November and we can still open our windows and enjoy the outdoors...we have had some snow already, but long gone now. I have been loving it. I have been finding a lot of new ways to do some advertising. Just getting my name out there. I have joined Etsypreneur...love that new community. I also have been doing a bunch of treasuries on Etsy. Those are actually fun to do. I never really did very many, but have done 3 or 4 in the last week or so. Go for it if you are on Etsy because usually the people you are promoting, have never seen your shop and then they make a treasury with one of your items and there you go...you have just hit several new potential customers. Yay! Anything for free! Well, that is what I say! First I go through and find something that strikes me...I favorite it. In the other window go to the treasury home page~create a list button is on the right side of the page. right click the item's link name, hit copy and then go back to the treasury page and click paste into the box. You just continue to do this with each item until all the boxes are done...Hit save! I have also been having fun trying out some new things in my shop lately...a new keychain and a coffee cozy. I also have several new appliques that I have been making. Check it out soon if you haven't seen them! I know I said I didn't really want to get into doing craft shows, but next month my brother is putting some little tables he is making into a couple of local ones and asked if I would help along with my mom. So needless to say I said, why not? So now I am helping my mom with outfits that she is sewing...mostly pillowcase dresses and skirts with matching tops with my appliques on them...and hair clippies and headbands to match...so I have been busy with that. My mom is sewing like a fiend...so hopefully I can keep up with her! I am staying quite busy now. Thanks to everyone for all your support and I hope that soon I will be able to get some more appliques listed in my Etsy shop...but for now I will be slow on doing that. Don't hesitate to ask if you would like anything because I will put my internet business ahead of what I am doing for the craft show...I just won't be finishing up any of my appliques I have on Facebook for now...or doing anything new. Thanks and Happy crafting! New Sales on my Etsy shop! I just wanted to talk about some of the great deals on Etsy I have right now. I am putting up my headbands with my appliques on them for $5.00 and FREE shipping to anywhere in the U.S. So if you have looked at these, please pick them up now before they are gone! I am not sure if I will be selling these again due to the fact that I have only sold two since I put them in my shop. I think they are adorable in your hair...the owl is on an alligator clippie and is detachable ...they fit toddler to adult. Sorry about the bad shot...but you get the look? Right! So go over and check those out...I am putting them for this price until they are gone! The other item I wanted to talk about was the cute bag that Sherri won. She picked my natural tote with a robot applique. I think it turned out so cute! You can also buy these bags from me with any applique for $10.00! I think they are perfect for kids car trip bags. I also love them for taking my small sewing projects to go! I don't have any in my shop yet...so these are custom order only. I will probably put one in the shop soon. Thanks so much and happy crafting, everyone! Thanks so much to all my fans of HollyCraft! The winner of my giveaway was comment #4. Sherry Taft....Thanks to all of you who entered! I will have another giveaway as soon as I reach another goal on Facebook! Time for a Giveaway!!! HollyCraft has hit 1000 fans on Facebook!!!! Well, I have to say I never ever really thought I would be having a giveaway to celebrate 1000 fans! I must say I am totally surprised and happy that this has happened! First of all, I want to thank every one of my "likers" as Facebook now calls you by giving you all a sale in my Etsy shop. will put pictures of my appliques up on Facebook, some even before they are finished, a few days before I put them on Etsy. If you are interested in any of them, be sure to comment on the picture or my page to arrange for purchasing the applique(s). This way I will be able to start the ones that you want first and we can also set up a custom listing and save you $. I am also running a few specials for my Facebook fans right now. If you would be interested in any of them PLEASE check out my Facebook Fan Page. Thanks everyone and happy crafting! I am still strictly doing Etsy to sell my stuff, but my niece has asked me to put some of my handmade items in her little boutique, so I decided I would do this, due to the fact that it is affordable! :) It is also fun because I have been trying out new things...like korker bows and headbands and things that I don't really sell on Etsy.I had my hubby and brother make up a crate tower unit to put my stuff in...I hope it will work great...I like it so far. I have been trying to figure out how to stick everything on it. I have been debating on whether or not to put my little creations in a strictly local artist/crafter store that is opening up about 45 min. away in a little touristy town. They want $30 a month for a spot in the store. Another thing I was wondering about is trying to do an arts/crafts fair. I think I have finally decided after talking with my husband and some other friends and family that I am going to pretty much stick to Etsy. ~I just really like the fact that I can keep my shop online stocked with however much I want. ~I can have as much or as little as I want. ~People can easily contact me with any custom orders. ~I don't have to pay a monthly fee. I have been working on several new appliques...have a look! 750 turned to an 800 Fan Celebration Giveaway! Thank you to all my fans! I am very grateful for all this support! To show my appreciation I would like to hold another giveaway! To be entered in the Fan Celebration drawing,to be done tomorrow morning, in your comment, you have to guess a number from 1 to 800. Random.org will choose the random number & the person who came closest will win one of my new monkey appliques! Winner can choose either a boy or a girl. Thanks again! Enter only once! My husband has been working 2nd shift the last two weeks. Let me just say I now have empathy for all the families who deal with this shift. I really hate it. Especially the 10 hr. shift. He goes in at 3:40PM and is there until 2AM. He gets home, stays up for about an hour and a half, then gets up at 11:30AM or later sometimes. So he sees our son pretty much never all week. What a drag. Not to mention the fact that I am taking care of the kids all day long and then the only time I have time to do anything for HollyCraft is after the kids go to bed so I am up all night too...so I am getting half the sleep and doing twice the work that I do when he is on 1st shift! Thankfully he is almost done...he only has to do it this one week more and then back to 1st. I have been doing lots of creating this past week. Here are the new shirts I did custom for a fellow Michigander! I think they turned out really cute...this was my first time attaching my appliques myself and selling them that way. Usually I just sell the applique and you do what you want with them! If you see something you like that I have I can do it for you...just convo me at my Etsy shop ~ http://www.hollyernst430.etsy.com I have more of the black and brown t-shirts in 2T and 3T. I also have some girl's sizes if you are interested. I also tried a tiger, but I think it is also just a cute little cat. Someone told me they look a little angry, so next time I will make them with more of a smile. I have some other requests for appliques, so if you can think of something you would like to see me try to do, comment below and let me know...I will try my hand at it! I put it on a onesie, but I will probably be doing it as just an applique. I don't really want to get real far into making them and putting them on things...I really just enjoy making the fun little appliques of my owls and such. I figure I will do a few of those types of things for people who just aren't crafty but really like my designs. But mostly I will do the appliques and then you put them on whatever you want to! I also finished a cute little monkey applique that I just love.... Don't you just love him? I was asked on Facebook if I could put a bow on it...so I may add another of these ones with a cute little bow. Then I will have a boy and a girl. Don't forget to check out my Etsy shop to see what other neat little items I put up today! Snag 'em before they're gone! 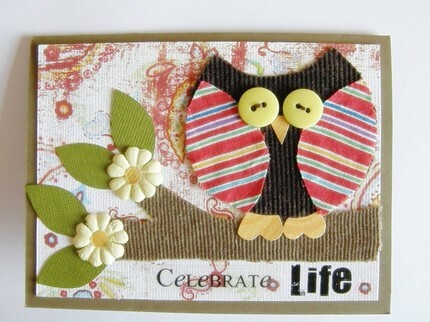 Have a great day everyone and happy crafting! I have the opportunity to set up a spot in a store that is opening up...does anyone have any ideas on how I should set it up...I have never really even done a craft show or anything with my little appliques...so I don't really know what to do. I was thinking of making a few items with them...like put them on clippies,... headbands, onesies and I have my cards...HMM? What do you think? Any advice or comments would help. I just wanted to show off my new items in the Etsy shop. I am so silly though because I already deleted all my photos that I used...GRR. 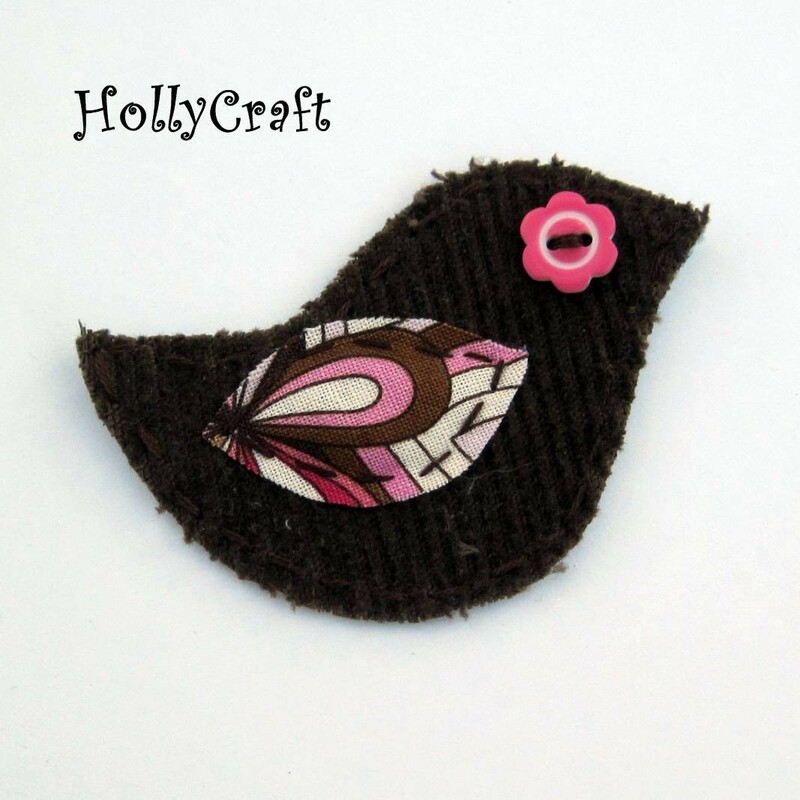 So if you would like to take a look at all the new things just go to HollyCraft . Custom Orders Are Always Welcome at HollyCraft...Just Ask! I thought I would post this tonight to let everyone know that I will do custom orders to the best of my ability...Just ask...:) My next big order just came in for a 15 inch tree...this will be my biggest yet...I will start work on it first thing tomorrow. Should be fun...It is 3x the normal size of my tree appliques. My brother is leaving his little guy with our Mom tomorrow so I have a full day to work on my stuff for HollyCraft on Etsy. I will be posting lots of new appliques! I will be able to get lots done with the kids at Grandma's! I also just found out I will be featured on Our Knickknacks in their featured fan segment next week Tuesday and then Friday! Hopefully this will bring in some extra exposure! It is an easy sign up...go check it out. Also if you haven't already seen this on my Facebook page.... if you would like some free advertising...go to this site...Foundhandmade they are giving everyone free blocks...simple to do. I have used their site before and I did get some extra traffic from it. I will post photos of my new items on here as soon as I can...Happy crafting, everyone! I have so many new things to work on this week...I need to do more owls, squirrels, dinosaurs, cupcakes, ice cream cones, trees,flowers...the list is endless I think. I was able to mail out all my orders today and Trina Grueck's owl that she won from my 600 Fan Celebration giveaway. Thanks again everyone for entering! I would like to try putting a few of my appliques on some onesies and other baby items soon...I just got a shipment of things from Rock Bottom T-Shirts, so I just need to figure out what I want to do with them now! Couldn't resist showing you my Sock Monkey I bought from The Monkey Shop...I thought it was so cute! I will put up all my new items on Facebook as soon as I can! Happy Crafting, Everyone!